Nirvana and Stella McCartney do not have anything in common, the grungy white trash boys and the hyper femininity luxury brand, it is awkward to draw a comparison or a link between these two. 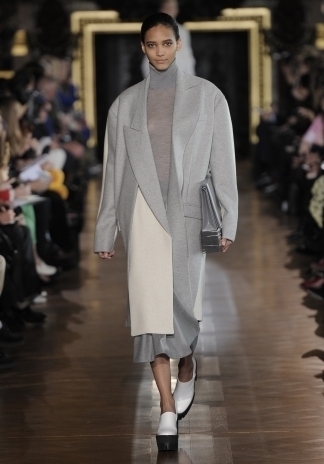 But after seeing Stella McCartney fall 2013 campaign, everything was clear! There is no doubt that the inspiration from this campaign comes from Nirvana cover album Nevermind. Strangely enough the whole collection is about boys meet girls skater Girls and the City, in another word it is Stella's new tribulations around what she has been doing since her first collection, designing a modern hyper feminine wardrobe based somehow on pieces coming from menswear. Of course Nirvana is not straightforwardly mentioned in a sense that the references are not litterally made (the show soundtrack was Disclosure feat. Aluna George White Noise and it was not in a skate park). Nirvana spirit is definitely there: androgyny, grungy skater and rebel attitude and the beautiful tartan. Suvi Koponen and Chiharu Okunugi look androgynous and fierce in their cocoon coat in the swimming pool. Is it clear now? McCartney is a womenswear label but we are pretty sure that there are men buying her clothes. A masculine attitude is one of McCartney's signature, but it is all about women. 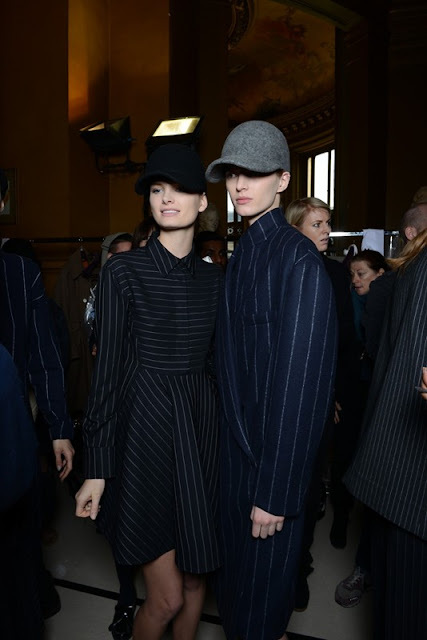 It is masculine shape or style for women who stay at the end with a androgynous touch. 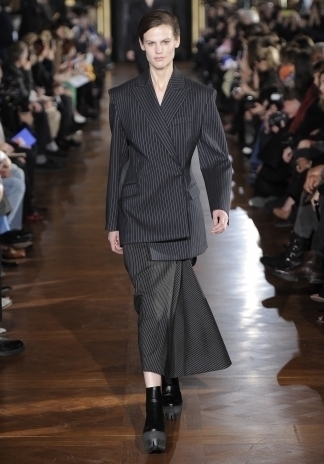 The italian stripe is re-invented in its basis dark grey colour with asymetrical suit, slim pants, a breasted suit with a long skater skirt. 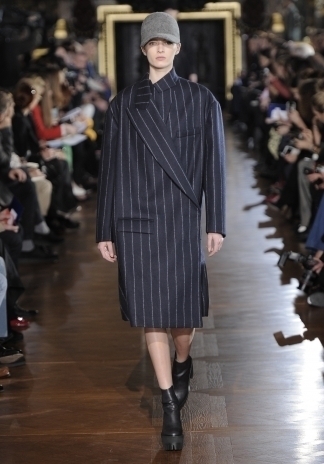 The comparison with a basic italian stripe suit is transformed in a lovely bustier dress, a long-sleeved collar dress and ends up in the more abstract version: a sportswear suit composed of a sleeveless basque top and loose pants. 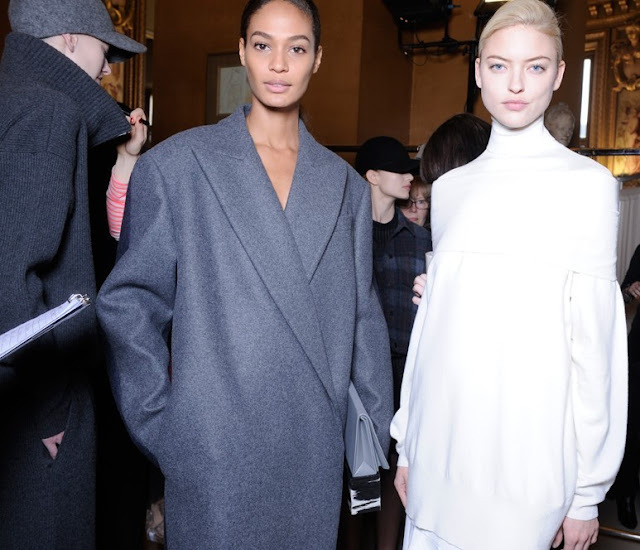 Sportwear is another McCartney's gimmick, but here, it is high-end streetwear and it is all about effortless chic made of comforable fabrics such as wool and cashmere. The stripe on the navy blue coat is no longer so italian like the long navy blue sweater matched with the long dark grey skater skirt. The long skater skirt is not easy to wear at all, actually is it a dangerous length for sure and we love this idea of the neo half-slip. The most brilliant ideas are also the simpliest like the loose roll-neck navy sweater and the short skater skirt. It is highly edgy, young, cool and women can easily wear it. Sportwear takes a upper way of sophistication when you look at the long polo dress made of wool/cashmere and lace. All the looks embody this ideas of rawness and luxury, like layering a bolero above a roll-neck sweater dress which ends up like lace dress with asymetrical ruffles, definitely this idea of hard and soft, of masculine and feminine or of luxury and sportwear. It is a well-balanced collection for women who like to be dressed like men but who stay true to their femininity. In a way, this collection is around the cliché of beauty like designing desirable dress such as this idea of a bustier dress which obviously screams "hyper hyper femininity". Here, we are not talking about the classic bustier dress which is a cliché of beauty. McCartney deconstructs and re-creates new bustier like the suit tweed dress and the silk draped see-through dresses. 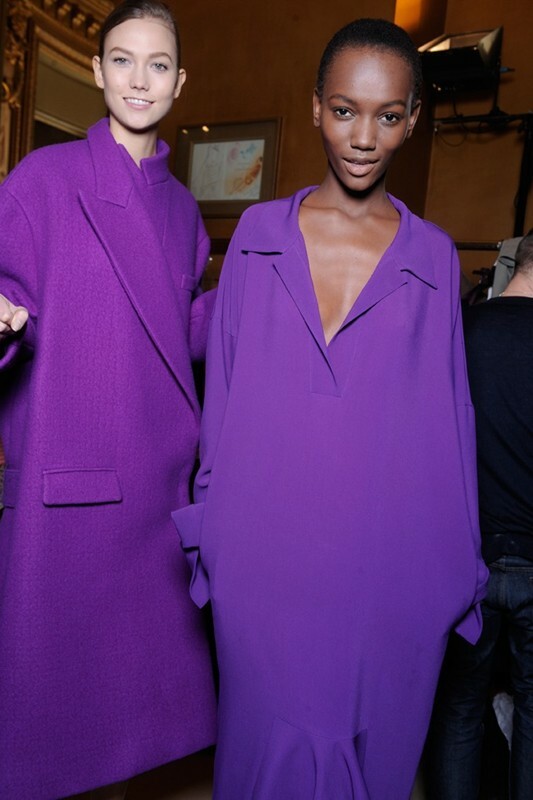 When it comes to colour, McCartney focuses on powerful bold colour like this gorgeous purple, a very YSL colour. It is very refreshing for winter, cloaking yourself in this fabulous oversized cocoon coat, definitely a must-have! Not so classic like this loose grungy tartan coat that you unconventionally wear like a dress. It is both classic and fashion forward like the silk/satin cream skater print dress and the sleeveless basque top and its matching pants. 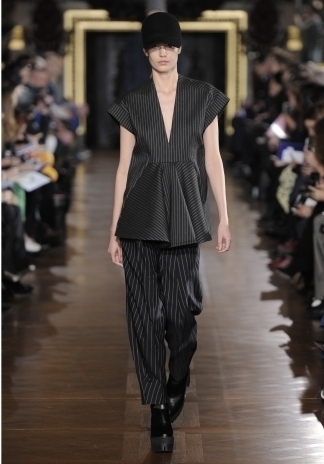 All the pictures come from DazedDigital and Stella McCartney's website. What would be Berlin without its Wall? Even if it has been down since the beginning of the 90s, you can feel its presence everywhere at least in the spirit of the inhabitants of Berlin. A sense of freedom, of equality, of brotherhood that astonished us (when you live in France, you understand how lucky Berliners are!). Be who you want to be, nobody will despise you or laugh at you, the most important thing is to feel free, to feel good and the rest will come naturally. When walking in the streets, you can't help wondering where you found yourself. Was it East Berlin? Or perhaps West Berlin? Not that important but it has left such a mark, both historical and emotional. So when we have heard that some parts of the Wall (near the East Side Gallery) are threatened by some promoters who want to build malls and accomodations, we are just like "Why?". Some parts of History even if they are hard to remember must be kept fiercely because it is so important not to forget, not to trivialize these events as if they were just minor ones. 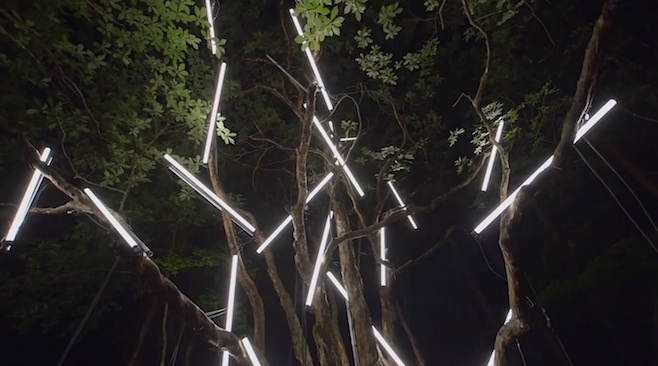 Volcano Choir, the project of Justin Vernon (from Bon Iver) along with the band Collections of Colonies of Bees are our Heroes this week with their new conceptual video for Byegone. This project is a very thrilling and unexpected gift for us as fans of Bon Iver and we cannot wait for their album REPAVE to be out at the beginning of September. And now let's cross fingers they will come to France for some lives. It would be so great! There are two ways of living in Berlin. Very different but very complementary. Chilling out, almost an institution. Living slow, cool, taking your time, forgetting about the hours, the day of the week, focusing on your well-being, on the sun on your face, on the breeze caressing your hair. And partying, almost a religion in the German capital. Spending all the energy you had gathered in during all these hours sitting (or laying down) on the grass. These clubs are huge, legendary, intense, powerful, mesmerizing and thanks to our friend Noëlla, we got the chance to discover and enjoy one of them. And she is exactly a representation of these faces of Berlin, young and free, cool and party-girl, speaking different languages. And if we had still any boundaries to knock down, Berlin helped us with this perfect cocktail(chilling out & partying). Almost a therapy! HUMOUROUS TEES OR ACT OF REBELLION ? LOVE MAGAZINE: A SWEETIE GIFT!